I’m kinda in love with artist-activist Julio Salgado. I avoided getting a tumblr for a long time. But when I found Julio Salgado’s art on my internet adventures one day, I accepted tumblr into my life just so I could follow his work. A queer artist from California, his work highlights marginalized folks, particularly undocumented and queer people. Within his art, he touches upon themes relevant to our class reading and discussions: the complexity of navigating intersectional identities and the power of creating something new within the contradictions. 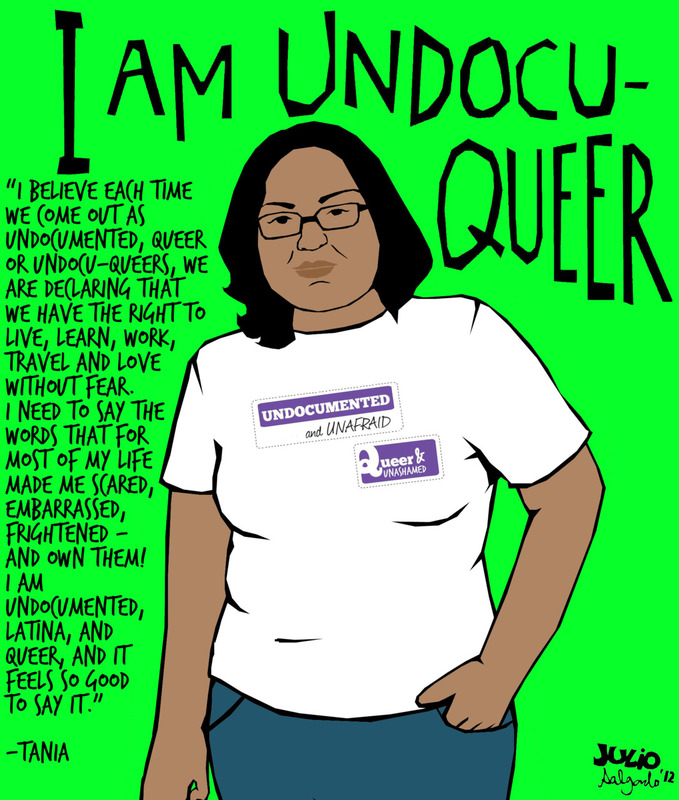 His series, “I am UndocuQueer!”, depicts undocumented, queer people with their own words expressing the liberation and power they feel when living openly. People living those intersections are frequently nameless, faceless, and voiceless – “illegals” with blurred faces in news stories, whether for their safety or for the continuation of their invisibility and disenfranchisement. Salgado’s art reminds his audience that undocumented people are, in fact, humans with complex lives and identities, who have dignity and power to voice their own opinions on immigration and other topics. There are no pre-written scripts for those who are queer and undocumented – instead, something new is created just by living with pride in a liminal, borderlands space. 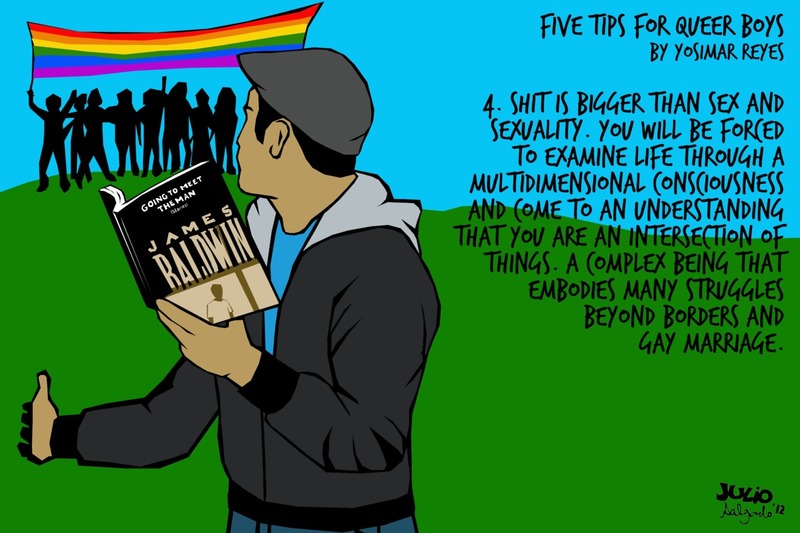 My favorite of Salgado’s projects was a collaboration with poet-activist Yosimar Reyes called 5 Tips for Queer Boys. Reyes asks queer boys to recognize the oppression they face, but external and internalized, and to feel strength in their own intersectional, creatively resistant identities. This picture in the series particularly reminded me of Mario from Heroes and Saints. Mario struggled in his life with his family, because of the secrecy he felt confined to. His double life felt impossible to him – to be a member of his family and his community and to be a queer man. However, despite running away, he was forced to understand his life and identity as tied to both his family and his sexuality. He was not fulfilled hiding his sexuality at home, but nor could he feel whole when he tried to ignore his ties to the issues of his community. He revisits his hometown, is finally accepted by his mother, and can embrace his complex identity by leading his community to action. Salgado’s activist art gives faces and voices to people who are not often seen or heard as their fully complex selves. As such, it provides a visual representation of the theories of intersectionality and borderlands.